Spring is here, which means spring cleaning is here, too. While practically no one actually likes to do the spring cleaning, it does make you feel good once you get rid of all of those bags full of garbage and old junk. However, spring cleaning does tend to create a lot of waste, but not to worry, we’ve got some helpful tips for you. Whether you’re cleaning out your office or your home (maybe both! ), here are five ways to spring clean with less waste! Get rid of outdated technology. There are a lot of places now that will recycle your old CDs, VHS tapes, computers, cell phones, etc. Or if it is in good condition, you could sell it online for a little extra cash. How many obsolete computers are in storage at the office? Talk to your boss about recycling them rather than tossing them in the garbage. Bottom line is, with personal or work technology, you can do more than just throw it away. Reuse when possible. Old clothes? If they’re in good condition, donate them to a charity or resale store. Many resale stores are always in need of business clothing so talk to your coworkers and see what people can bring in to donate. Donating and reusing rather than throwing it away cuts down on the amount of waste that goes to landfills. Use reusable cleaning supplies rather than disposable. What this means is using sponges and reusable cloths to scrub and dust rather than a bunch of paper towels. Not only will it reduce waste, but it’ll probably clean better than paper towels as well. Choose “green” cleaning products. Try to avoid using cleaning products that contain toxic chemicals that could be considered household hazardous waste; these kinds of cleaning products can contaminate other recyclables if not cleaned and disposed of properly. Recycle! 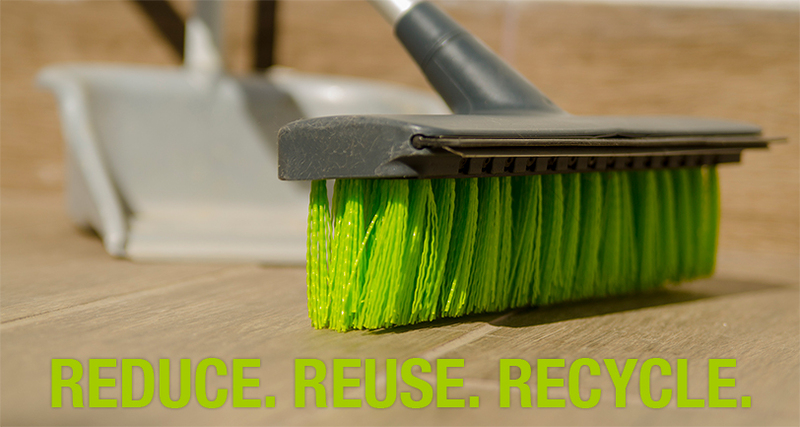 This one may be obvious, but recycling can really cut down on the amount of waste created during spring cleaning. Old newspapers or magazines? Recycle it. Dishes you no longer need? Drop it off at the resale store. Empty packaging? Recycle it. Greencore® is a division of Petoskey Plastics serving a multitude of markets in the custom packaging industry. Our constantly evolving research, technologies, and materials have led to a long list of high-performance polyethylene products that are both good for the environment and good for the customers. Some of our products include can liners, retail trash bags, recycling bags, compactor bags, and Greencore® Can Sacks™. Learn more at greencoreproducts.com.